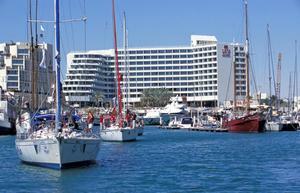 The Crowne Plaza Eilat is located on the promenade overlooking the lagoon. Many culinary surprises await guests at the hotel. The modern health club consists of an aerobic workout room, dry and wet saunas, massage rooms, cosmetics, chiropractic and mud treatments,along with alternative medical treatments. *Entry to the health club and spa and the use of its facilities (including the swimming pool, Jacuzzi and sauna) is permitted from age 16. The hotel offers daily entertainment and shows as well as a"Freckles Club" for kids. * At the winter, the hotel's pool will be 28 Celsius degrees, the pool is not covered. The hotel offers inflatable park. the park is open from sunday to thursday at 14:00-19:00. Friday from 10:00 am until half hour befor shabbat. Saturday 10:00-19:00. It cost 5 nis to the hotel's guests only and 25 nis for external guests. The Crowne Plaza Eilat located on the promenade overlooking the lagoon on the shores of the Red Sea.